Hello all! I’m back, and as promised, today we’re going to take a look at Orchestral Tools’ TIME Macro. This is a fairly recent collection, and falls under the category of additional colors, or textures, to enhance and add nuance and realism to your tracks. This is a fairly non-traditional and unique offering, as opposed to a “bread and butter” set of standard articulations. Instead, this collection focuses on movement and swells, unique textures and timbres, and subtle sound ‘palettes’ that may not be possible to achieve using your standard orchestral libraries. These kinds of products are right up my alley, as I do enjoy having this kind of motion or movement embedded into the performance itself, so I can just open the patch and instantly play, without having to fuss around with CC01 modulation. The library retails for €349 , or approximately $399. 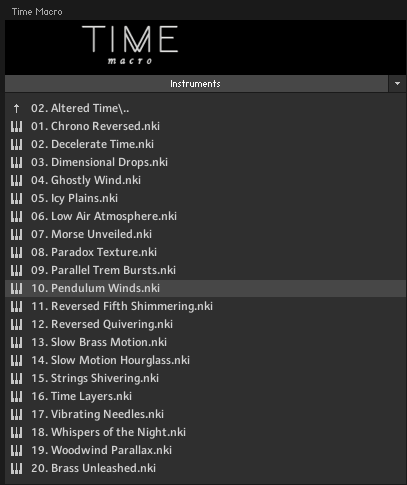 TIME is a recent collection of textures released by Orchestral Tools. This library is categorized into Multis and Single Instruments, and then into Combined and Individual Sections. By nature, the sound is very atmospheric, textured, and overall amazing. I can’t help but get a major Spitfire Audio vibe here, as not only are some of these patches extremely similar to what’s offered in Spitfire’s Orchestral Swarm, but a lot of them seem to really revel in the softer dynamics, and instantly remind me of some of the sounds from Albion V: Tundra (example: sul ponticello and col legno articulations). The library offers standard sustains, but where it really shines is the unique offerings, such as the playing styles mentioned previously. The Sul Ponticello strings have a more harsh and grating sound, while the Col Legno are very soft and airy. A personal favorite of the String articulations was the “Sustain 5th Drops” and the “Trem Bursts”. These capture details and colors in the actual performance by the players, so it’s very natural, and something you would not be able to properly recreate with standard articulations. Sounds like these can instantly add realism, nuance, and atmosphere to any track you could think of. This library does focus primarily on long notes as opposed to short or dotted notes, although there are some of the latter. I found the Woodwinds Combined and Individual sections to be my favorites. I just love the magical sound of woodwind instruments playing at soft dynamics, and this library absolutely nails it. Every articulation here sounds very ethereal and magical, and would work wonders at building atmosphere or enhancing the colors in a fantasy styled composition. The Individual Woodwind Sections (High and Low) offer an “Airy Sustain” patch which sounds especially beautiful and haunting. The three main patches in the combined sections are Strings, Woodwinds, and Choir. Having the addition of a choir here is very nice, and while it’s not comprehensive as far as features, it absolutely gets the job done and offers some wonderful sounds. In the Individual Sections we have the Strings, Woods, and Choir, split into High and Low (or Male and Female for the choir), and this is where we also find the Brass articulations (which features Sustains and long marcato as well as the familiar textures), as well as “Harps and Vibes”, “Double Reeds”. The “Harps and Vibes” patch is very beautiful and delicate and a personal favorite. The “Altered Time” sounds are breathtaking. There is a section called “Altered Time”, which plays around with reversing the samples and other time based experimentation, and it contains some of the most amazing sounds of the entire library. It’s exciting opening up each new patch and having a small idea of what it will contain based on the name, but it always is surprising and utterly beautiful when you strike the keys. 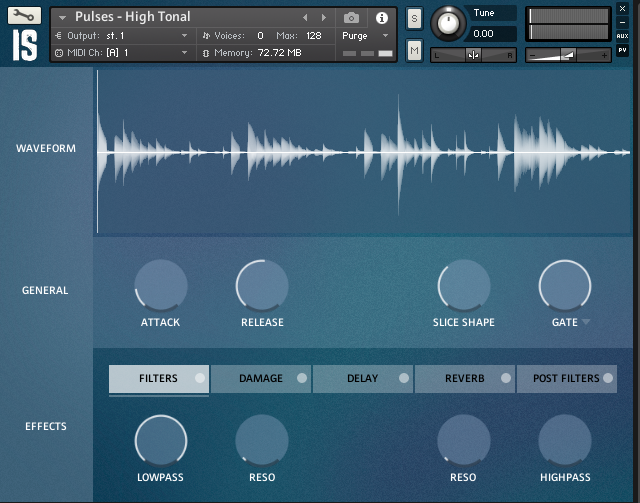 The “Pendulum Winds” patch sounds almost like an organ in places, as the instruments play and swell in reverse and create a purely magical pad-type sound. Think of these as some sort of orchestral synth, as the sounds are very pad-like but incredibly organic, full, and rich. For owners of the library, make sure you experiment with each and every sound included in “Altered Time”, as they truly are magnificent. This library is truly a unique and beautiful offering from Orchestral Tools. It isn’t cheap, at $399, and be advised it does not contain legatos, although it does contain all the sustains and motion/performance based textures you might possibly need. 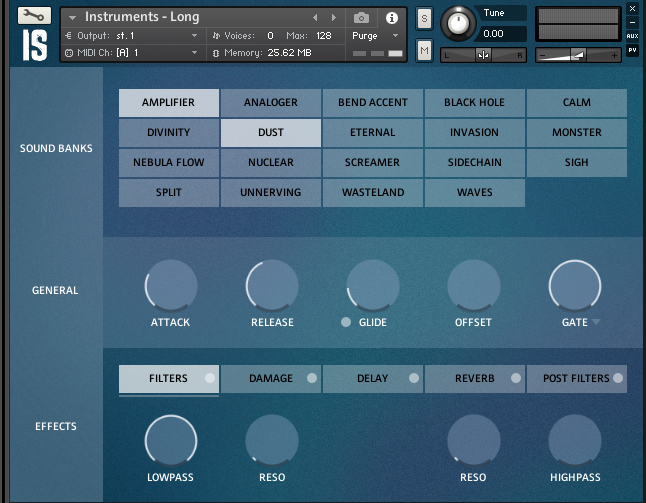 Alternatively, there is Orchestral Swarm from Spitfire Audio, which has some VERY similar sounds, although Orchestral Swarm seems to offer more in terms of dotted note articulations, and does not include a choir or any sound design style presets (like the Altered Time section), but it does retail for quite a bit less. If you are in the market for unique and atmospheric orchestral colors, or simply want a product that captures more of the player’s performance in the samples, than you really can not go wrong with TIME Macro. I use it very frequently to spice up soft/intimate tracks, just make sure you have the standard articulations covered before you purchase, as this library is more for additional and unique textures. -No standard legatos, which would be nice, as you could do an entire track with this one library alone. Before I dive in and start on my official review of Hexeract, the synthesizer by Auddict, I am going to simply share some of my experience with it so far. If any of you have been following this space, you may know I posted a “first look” article about it, and a couple YouTube videos walking through all the presets and samples and offering some impressions. I’ll try to be as professional as I can here, but I’ll warn you up front, not much about my experience with this product has been positive. Now, I understand all companies must fuel the hype train and market themselves, but these are very bold claims, however I was genuinely excited about it, and come on, the interface and design just looks awesome. I purchased this product shortly after it released and, sadly, immediately ran into problems. This is purely my experience but I have read about many, many users reporting similar experiences. My DAW of choice is FL Studio, and Hexeract simply didn’t work with FL Studio initially. Any time I changed the tempo of a project, it crashed. I ran into countless error messages and crashes, the magnitude of which I’ve quite honestly never experienced with any other product. I would get it to load up initially, and play around with the sounds, some of which were very cool, but ultimately it would crash, or upon loading the project again after saving and exiting, I would run into multiple error messages and the entire project wouldn’t load. I contacted support, heard nothing for a while, contacted again and they replied after about a week. I got a reply not from the official support email, but my initial email had been apparently forwarded to the developer of the product. After explaining what happened, he told me he would take a look at it. A couple weeks went by and I sent some follow up emails which seem to go ignored, so I took to the KVR forums to kind of vent a bit on a thread about the product, and see if anyone had similar issues. I stated the product was simply unusable and wished I could just get a refund, honestly not thinking anyone from the company would read it. I got an email the next day, apologizing for the wait, and offering a refund if the problem didn’t get fixed. I felt better after that. He eventually sent me a hotfix that fixed the issue. Now I could finally test out the product! When you load up Hexeract, it really is quite beautiful to look at. I love the design, the color scheme, everything about it visually hits all the marks. Initially there were only two banks of presets, but the have recently released an update to version 1.1.0, so I figured now was as good a time as any to revisit this product and write my in depth review. The core of this product consists of three oscillators, which allow you to load up samples as well as standard synth waveforms. I found this to be quite interesting and unique, and kind of exciting to explore the potential sounds you can create with that. 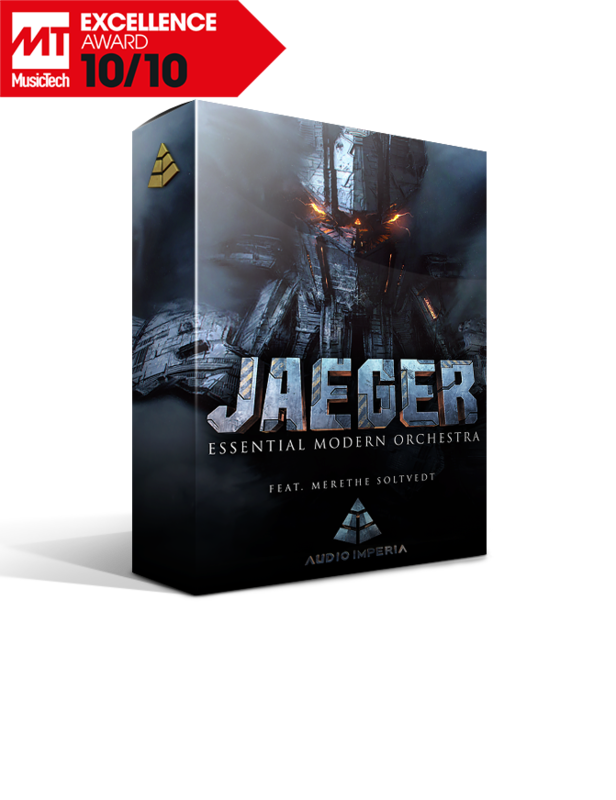 Knowing that Auddict is a fairly established and well regarded developer of orchestral samples for Kontakt, I was expecting some great quality samples to be included with this product. I began by scrolling through the presets, checking them out one by one. They come organized in to different categories, which vary depending on which preset bank you are currently using, For instance, in preset bank 1, you have Bass, Bass Sequences, Bursts and Blares (similar to the beloved Hollywood trailer “Inception” sound, The Braam. 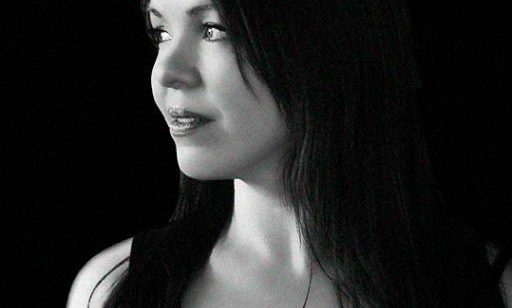 ), Ensembles (orchestral in nature, with some added synthesis), Hits/Kicks/Etc, Leads, Pads, One Note Pads, Sequences, Shorts, and Tailored Instruments. My personal favorites were the Bass Sequences, One Note Pads, and some of the Sequences out of the second preset bank. The sounds were spacey, yet mostly organic in nature. For the most part, the presets where movement or rhythm was involved were where this product really shined. The kind of sounds that you can find on other synths, like leads, pads, etc, were simply underwhelming. There was nothing cutting edge or groundbreaking about any of these sounds, largely sounding worse than what I could achieve with any of the soft synths I own. While some of the presets are quite good, the quality of the samples is fairly bad overall. It all sounds very midi. This is especially disappointing as Auddict has very good orchestral libraries, and it would be nice to have some included here. Now I know this product’s focus is synthesis, but it’s simply another marketing boast that failed to live up to expectations. I’m not kidding, this happened as I was writing the review and browsing presets. Most concerning were the performance issues and overall flakiness and instability of the engine. Even after the 1.1.0 patch and update, I continued to run into quite a few issues. Sometimes when loading a preset and testing it on various keys in different ranges, the sound just cut out, and then the plugin would output nothing but silence no matter which preset you loaded. It had to be deleted from the project and loaded again, which would sometimes simply result in a crash. When this happens a few times, it get’s insanely frustrating. Note, this happens even with the 1.1.0 update. I also get pops and clicks, and harsh glitchy noises sometimes, as if trying to load a corrupted sample. (To be sure, I have uninstalled and reinstalled this plugin and re downloaded all content a few times.) I noticed on my previous machine, that loading around 6 instances of Hexeract caused some truly insane lag and slowdown of my DAW. Now that I have a more powerful machine, and the update promises better CPU utilization, I of course wanted to test this out. I have a project with around 15 instances of Hexeract, and during a part where about 10 are playing at once, my system again experiences the worst slowdown and lag I have ever witnessed. Note: I have a Core i7 8700k at 3.7 ghz, and 64 GB of RAM. This kind of performance is laughable and simply inexcusable. I really held off on writing this review for many months, as I am an understanding person and I really just wanted to believe in this product and have faith the company will come through and deliver on all the promises. I realize however, that by being a reviewer of products, I would be doing a disservice to everyone if I was not completely honest in my review. Auddict released an unfinished and broken product, there simply is no other way to put it. While I commend them for trying, quite frankly they failed, and I believe they are in over their heads, resulting in lack of support and long delays in getting back to customers, if they get back at all. While some of the presets sound awesome, there’s nothing to really LOVE here. There’s nothing this product does I can’t do MUCH better with any soft synth or a vast number of better sounding (and consistently stable) Kontakt libraries. More importantly than how it sounds, is how awful the performance continues to be even after a big patch/update. Don’t expect to get any sort of usable performance with more than a few instances loaded, whereas in any other project I can load 30-60 instances of Kontakt with absolutely no hiccups. Like I mentioned earlier, I was really excited about this product, and it was massively hyped as groundbreaking and something that could do cinematic synthesis like no other. I can honestly tell you, in all my years of producing and composing music, I honestly have never been more disappointed in a product. I think it comes down to this : Auddict over hyped, over promised, and rushed the release of this to coincide with Black Friday 2017. The released a buggy, unusable mess, and almost a year later, and many, many dissatisfied customers chiming in on forums all over the internet, they finally released an update and new presets and promised to fix the issues. Mind you, the dev emailed me a hotfix for users of FL Studio back in June. There was NEVER an official release of this hotfix. I have had at least three FL Studio users see my videos or reviews and ask me for the hotfix, because they said they contacted support and hear nothing. I gave them all the fix that was shared with me, but honestly consider this: these users got better support from a random guy on the internet than they got from the actual company who released the product. I don’t even care if the new presets offer the most mind blowing sounds imaginable. One thing remains : it still seems to have serious bugs and performance issues and I simply can’t consider this a reliable product at this time. I hope it continues to improve, but as for the recent patch, it was simply too little too late. If you enjoy stuff like this, you’ll love Hexeract. +Some great rhythmic presets, pads. Presets with rhythmic tendencies or evolving sounds really shine. -It’s simply a broken product. Bugs, Crashes, Poor Performance, even after waiting almost a year for a patch. -Very Limited Amount of presets compared to other synths. -Does nothing new for me, despite all the claims and hype. TL;DR: Buy Synthmaster or Serum Instead, or INVEST in some trusted kontakt libraries from output, Heavyocity, etc. You’ll thank me later. Today we’re going dig into 8Dio’s Century Brass ensemble library and offer some honest opinions and thoughts about it. This full version Kontakt library was released at the end of last year, continuing their Century Series of orchestral instruments, which at that point only contained Century Harps (as of posting it now has Solo Brass, Strings, Sordino Strings, and Ostinato Strings as well). 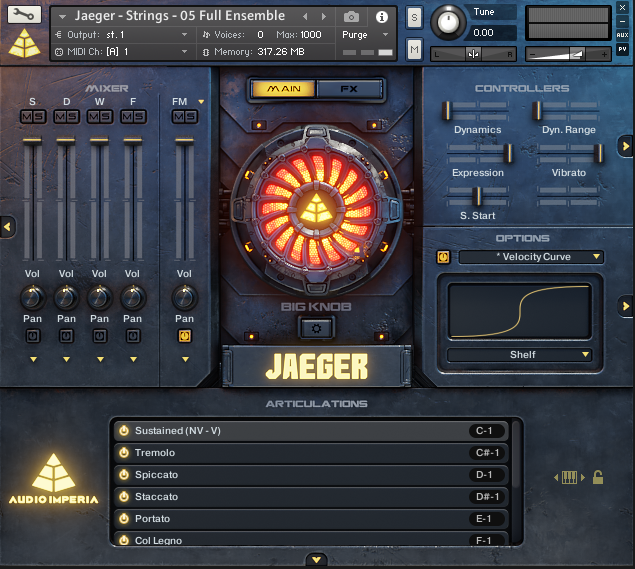 I was very attracted to a hearty discount of 40%, which they offered last year during a store-wide sale, and I had been searching for Kontakt libraries to gradually replace East West’s Hollywood Orchestra series, as Kontakt consistently provided me with better performance and ease of use than the Play sampling engine which is used by East West. I was really impressed by the demos of their Century Series. It seemed to offer an incredibly detailed sound, with an astonishing level of realism, versatility, and playability. 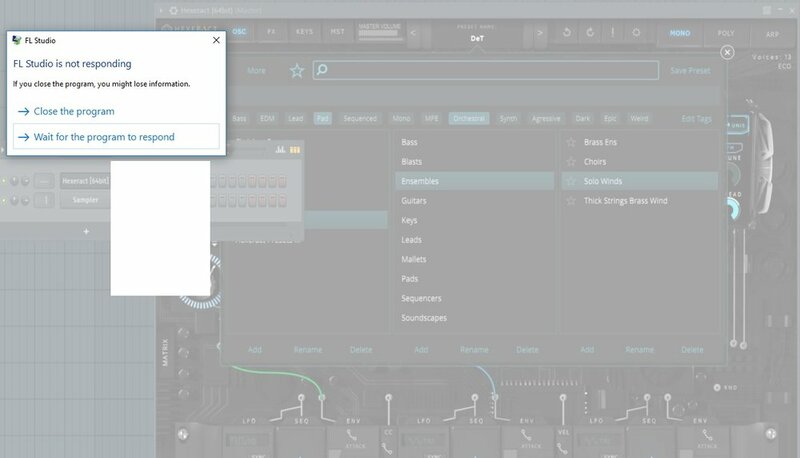 They provided free “Try-Packs” of some of the patches available as well, and I was very impressed with the realism of the legato scripting in the Try-Pack for the 6 Horn ensemble. The Century Series interface is simple and clean. Century Brass is a library that does not register in Native Access, therefor you have to go to the file browser in Kontakt and load it up manually. I’m generally not a fan of this approach, and it honestly confuses me, as 8dio is a major player in this business and can easily afford the fee to Native Instruments to enable their libraries to be loaded up in the library panel. Upon loading, however, I was fairly pleased with the simplicity of the interface (some might find it a bit bland), providing easy access to all the controls and mic positions. What really impressed me most is the way articulations and keyswitches are handled, allowing you to load up to TEN articulations in any order, and assign them to the keyswitch of your choosing. This seemed like a really nice way to sort of customize and tailor the library to the playing style of each user. 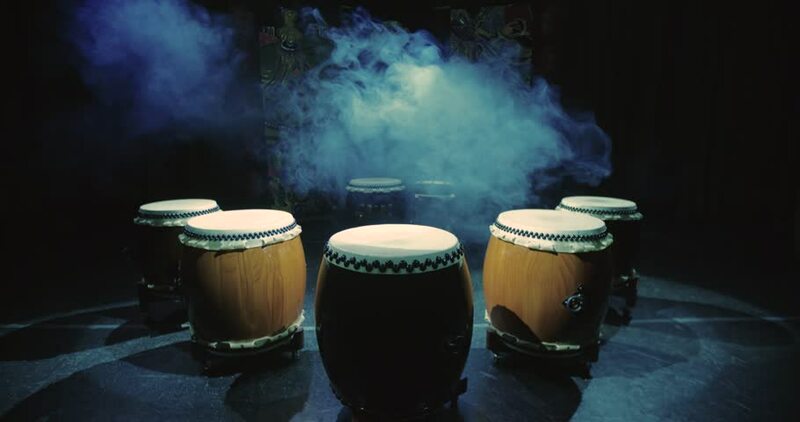 As for the articulations, there are an impressive amount here, including mutes, rips, crescendos, loure, flutter tongue, and one of the main selling points, according to their marketing, the Arcs. Century Brass Ensemble offer’s a very large selection of articulations. When researching this library I was confused about this term “Arcs” being thrown around all the time, but it’s just an articulation featuring the players performing a dynamic swell, starting at the lowest dynamics possible and naturally rising up to full velocity, and then slowly tapering back down. To me, I just call them “swells” when I am describing them to someone else. They really are quite spectacular to play around with, and immediately I found myself using this articulation in every single track. It adds another level of realism, instead of just controlling dynamics with the mod wheel or CC automation, having these dynamic changes already taken care of in the actual performance really is something special to have in any composers arsenal. The overall sounds of the instruments here are spectacular, captured in pristine detail and capable of performing in a truly impressive dynamic range. Everything is recorded centered, so you’ll have to manually pan to simulate a natural orchestral seating position. From the name of the library and the imagery of the marketing, it does feel they are catering this towards a more traditional composer, maybe even to classical and classic film styles, and the library really performs beautifully in the soft and mellow ranges. However I was also thoroughly impressed with the ability to really crank it all the way up to ff, and get an incredible amount of growl, heat, and a bold, majestic sound. This could easily be used as the only brass library to compose a modern epic or trailer track as well, I have no doubt about that. The default mic position is a mixed mic, and it offers a lot of closeness and detail while maintaining the width and space of a further mic. I found the default mix to sometimes be a bit too close, however, especially for the horns. For the 6 Horns patch, which is spectacular, I found it really sounded best with only the Decca mic enabled. There was just something different about the default mix, which is not a bad thing, just not what my ears were used to. The trombones give an amazing amount of growl in the higher dynamics, yet still warm in the softer dynamic ranges. I found the short trombone notes to be really fun to play with and wonderfully brassy, while the trumpets were bright and natural especially in the higher register. I did find there to be a lot of articulations that may not be necessary and some unusual choices as well, such as a “speed” knob to control the quickness of the legato transitions and how fast the arcs played. I found this really odd for the crescendos and arcs to be controlled by a knob with no numerical value, instead of syncing to the tempo of the DAW, and found it quite cumbersome to have to tweak the speed knob over and over until it matched the tempo of the track I was working on (not to mention re-adjusting for tempo changes, etc).. I did email 8Dio support about these issues, and they responded saying they were aware of the issues and they would be fixed in an upcoming update, so I have no complaints about support as they got back to me immediately and said they are working on a solution. I also noticed Colin O’Malley of 8Dio has posted on a VI-Control forum back in March 2018 promising they are working on a free update for this library to offer new mixing options including pre-panned mixes, etc. I was a bit worried after I read users feeling that 8dio sometimes abandoned their libraries instead of releasing updates and fixes, but it seems if that was ever true, they are doing much more as a company to listen and stay engaged and offer updates to their customers. +Amazing detail and realism in soft AND loud dynamics. +Vast Amount of Articulations, including unique and highly playable arcs. +Intuitive GUI with ability to customize key switches and load up to 10 articulations, all in one NKI file. -Some strange choices such as the speed knob, only one length of marcatos. -A few bugs and inconsistencies really bring down the usability sometimes, especially with the otherwise incredible legato patches. TL;DR: Century Brass is a very good library, but it’s note quite achieved greatness yet. The wealth of articulations and versatility, as well as the realism and detail captured in the recordings, are some of the highlights of Century Brass. These standout features are slightly marred by inconsistencies and bugs, but I have high hopes they will address these issues in the upcoming 2.0 update! Spitfire has released an update for this library, which addresses one of my main disappointments with this library: the lack of an all-encompassing and expressive performance patch, ie Joshua Bell Violin by Embertone. This update has added exactly that! A Solo Violin (Virtuoso) Total Performance Patch. I must admit, I was not expecting them to add this, but it’s quite amazing and performs VERY well. I feel this now fills the gap that was missing between having a truly intuitive, deeply expressive, and instantly playable solo string instrument and having a library that does everything else well. They have also fixed the issue with the batch re-save that I mentioned earlier. Overall, I am very pleasantly surprised with this update, and I feel it’s only fair to update my final score for this library now that it has been significantly improved. Hello all! Today we are taking a look at a new solo string library from the folks at Spitfire Audio. The original Spitfire Solo Strings was their first sample library ever, and the release of an all new Solo String library from Spitfire has been long awaited. I owned the original Solo Strings and got a discount upon purchasing the NEW Solo Strings, and they cost me $189 instead of $399. This library loads up through Native Access so it has it's own panel in the Library Tab of Kontakt, which is a welcome addition. This library features all new players and recordings from the original, as well as an updated GUI. I was expecting a MASSIVE step forward in terms of sound, and more importantly, instant playability. I must admit that, while delivering on the quality of the recordings and providing many useful and great sounds, in the end they did not live up to expectation in regards to playability. The library has all inclusive patches for three separate Violins (Virtuoso, 1st Desk, and Progressive), Viola, Cello, and Bass. For more detailed info about the different types of violin patches than I could ever give in my quick review, see the official page here. I feel in every Spitfire collection I own, the short notes always stand out as being spectacular, while the longs and legato leave quite a bit to be desired. I found this library to continue this tradition. The shorts are always crisp, tight, and highly detailed and realistic. I also thoroughly enjoy some of the new articulations, like the Long Flautando and Long and Short Harmonics. I feel this library nails the articulations that are unique and provide some very interesting textures and timbres to add to your existing orchestral palette. I found the standard long notes in the main NKI files to be quite lacking. It takes a lot of time and MIDI programming to get these to sound good in my opinion. With so many libraries simply sounding incredible from the first note "right out of the box", this was quite disappointing especially after so much hype and waiting so long since their original Solo String Library. The attack and release leave a lot to be desired and require a lot of tweaking to get these long articulations to sound realistic. Now, when it comes to instant realism and playability for Solo String libraries, in my opinion there is NOTHING more vital than a highly expressive legato patch. I was honestly quite concerned when there was less than a month until the release of these new Spitfire Solo Strings, and there was yet to be a single demo showcasing any type of legato patch. In fact, there was no such legato demo until the library had already launched. With so many incredible and expressive libraries already on the market (such as Strezov Samplings' Macabre Strings, and Embertone's Joshua Bell Violin), I was hoping they would really deliver on this aspect and take a new step in expressive realism for solo string instruments. The legato is definitely a step up from the original Spitfire Solo Strings from a few years ago, but still, in my opinion this again takes a lot of time and effort to get to sound realistic. It does allow for faster playing between notes, which is a plus, but it still does not have enough expressiveness and instant gratification to stand against some others currently on the market. I often have to deliver tracks for clients in a matter of days or sometimes even hours, and I (and many others) simply need something that just WORKS as soon as you open it up. This is the magic of modern sampling in my opinion, those moments when I am utterly blown away at the sound coming out of my speakers, and I am thoroughly convinced I am listening to a real musician playing this instrument in front of my as opposed to samples. Sadly this does not quite deliver that "wow factor" that so many other sample libraries have managed to achieve. This library is more of an all-compassing solo string library and probably has every articulation you could need for solo string writing in a standard or classical arrangement, but in terms of expressiveness and true emotion it cannot deliver the “wow factor” of some others on the market. For the price you do get a lot, however I don't believe I will ever use the sustained notes in any of my compositions simply because I do not enjoy the sound. The short notes are amazing, as is to be expected from Spitfire audio, but the standard sustained notes are like night and day compared to the realism of the shorts and actually sound a bit grating. I wish they would have focused more on making this instantly gratifying and easy to play straight out of the box. For the basic articulations, it definitely delivers, but for emotional and virtuoso playing, I'd simply look elsewhere. I often use the short notes and occasionally the Flautando and Harmonics to add unique textures. I prefer solo string libraries for those fluid and emotional legato lines, which this library does improve upon from the original Spitfire Solo Strings, but doesn’t stand up to what’s available on the market from other companies. There is also too many violin player patches that don’t differ enough for me to be really impressed by one over the other, I do however know these could be very useful to some composers, I just am not one of them at this time. I must admit I used to be excited about new Spitfire Audio releases, but lately I have not been a fan of their marketing and focus as a company, as they seem to release countless string libraries and fail to truly innovate, not living up to the reputation they once had as an exciting and top of the line sampling company, instead lately I find them a bit boring and pretentious in the way they market themselves, which is strictly a personal opinion and does not mean they do not produce quality products, I just fail to get truly excited when they fail to innovate like the did with the Albion series and some of their artist specific libraries and composer toolkit’s. There is also a bug preventing a Batch Resave within Kontakt with this particular library, which makes loading very long every time I open it. + Vast amount of content and playing techniques. + Realistic sound, providing the superior detail and quality expected from Spitfire. + Unique articulations you may not find elsewhere. - Simply can’t match the emotion and expressiveness of other libraries on the market. - Long notes have an overall sterile and bland feel. - Three violin player patches that fail to deliver anything significantly new or exciting to make them stand out from one another.